1. Reminiscent industrial design: MK-35-F1.7 is with a metal construction, compositing of a highly polished metal mount body and a knurled metal focusing ring. 2. Easy to use: There is a depth of field scale provided and distances are marked in both feet and meters. The front element does not rotate, so use of polarizing and graduated filters is much easier. A push on plastic lens cap is provided and this shows no signs of being likely to fall off in use. 3. 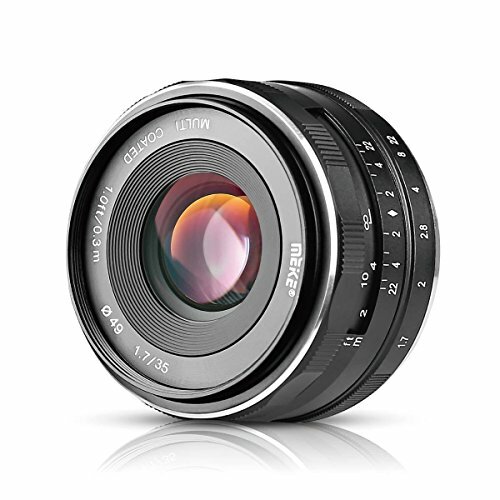 Resistant to dust and prevent flare; and nice circular aperture: Meike MK-35-F1.7 comprises 6 multi-coated elements in 5 groups. The diaphragm has eight blades, which offer a nicely circular aperture. 4. Good image quality: nice color, lovely bokeh and very well controlled Chromatic Aberration, The Meike 35mm f/1.7 lens is a well made and attractive optic lens. 5. It is a manual lens for manual purists, who will be rewarded with excellent central sharpness in your portraiture and other kinds of photography. Canon EF-M Mount Mirrorless Camera, such as EOS M1/M2/M3/M5/M6/M10/M100 etc..